When you buy goods and services including disability-related purchases, you have rights under law. 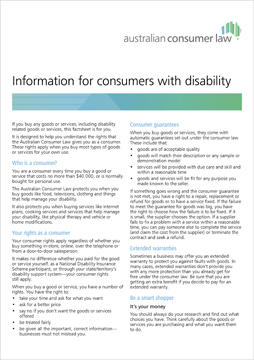 This fact sheet explains your consumer rights and the steps you can take to resolve problems. This publication was developed by the state/territory consumer protection agencies and the ACCC. You can order a braille version of this publication by emailing a request to publications.unit@accc.gov.au.